Feline obesity is on the rise but many cat owners are unaware of just how fat a cat actually needs to be before they are considered overweight. An overweight cat is at risk of a number of health problems so it is in our best interests to help our moggies lose those pounds! We’ve detailed some of the main reasons cats become overweight, what health problems they might be at risk of developing and how you can help them to lose weight. Obesity is a highly underestimated condition with a simple treatment, so be sure to have a quick read of this guide and make sure your cat is a healthy cat. A shocking 39% of cats included in a recent study we considered obese. An obese cat is one whose weight is 20% or more above their ideal body weight. If we image the typical cat has an ideal weight of around 4.5kg, a mere 1kg more (which might seem like nothing to us) is enough for them to be considered medically obese! An overweight cat has a body weight 10-19% above their ideal weight, this means as little as 450g (roughly 1lb) is enough for a cat to be considered overweight. Owners of long-haired cats are more likely to underestimate their cat’s weight, but long-haired or not, there is a simple scale you can use to determine if your cat is over- (or under-) weight. The Body Conditioning Score (BCS) scale is a 5 or 9 point scale with 1 being too thin and 5/9 being too fat. On the 5 point scale, an ideal score is 3, on the 9 point scale, the ideal score is 5. The score is based on a number of observations including; profile of your cat from above and the side and how visible the ribs are. See here for more information on body condition scoring. 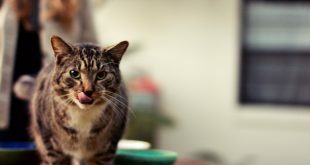 Feeding Frequency: Providing a constant source of food for your cat, so they can eat whenever they want has been shown to increase the likelihood of obesity – as has feeding 3 or 4 separate meals a day. Ideally, a cat should be fed multiple small meals per day. Number of Cats per Household: Cats living in multi-cat households are more likely to become overweight. In some cases however, the reverse can be true as some cats will ‘bully’ the other cats and reduce the amount of food they can eat. 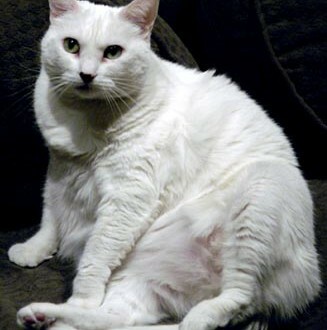 Age: Middle-aged cats are at the greatest risk of becoming overweight. As a cat ages, the amount of food they need actually increases, this is why obesity is most commonly seen in middle aged cats. Treats: It won’t be surprising to hear that the more treats you give to your cat, the more likely they are to become overweight. Did you know that giving a cat a glass of milk is the human equivalent of eating four hamburgers! One of the simplest changes we can make to control our cats’ weight is feed them a calorie controlled diet and fortunately there are a number on the market. These diets have a greatly reduced calorific content but still taste appealing for your cat. 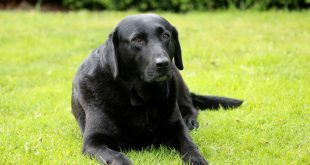 Previous Do You Pass The Dog Ownership Test?